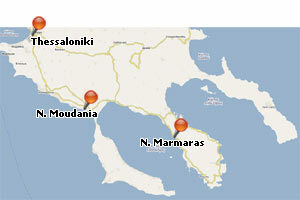 The New Marmaras is one of the most remarkable tourist resorts of Macedonia. It is built on hills and is surrounded by a beautiful pinewood. In the Eastern and in the western are two big splendid sandy beaches with clean sea that have repeatedly gained the European reward of the "Light blue Sea". The purchasing curiosity of the visitors can be satisfied in the various shops of pop art, clothing, food e.t.c. and in the various restaurants that offer abundant food of exceptional quality and mainly fresh fish. For their amusement they have the opportunity to select between one big variety of bars, clubs, discos, etc. At the foot of the hills someone can visit the beautiful old settlement of Parthenona, the buildings of which are maintained in good condition. 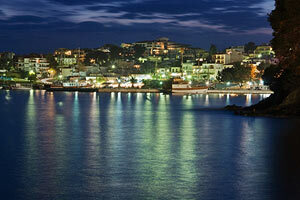 In the eastern of Marmara is found the eminent group of hotels of Porto Karras. It has an amazing organisation and a secure Marina for smalland big sailboats.